Chemical, physical and thermal properties of acetone, also called 2-propanone, dimethyl ketone and pyroacetic acid. Phase diagram included. Acetone (2-propanone), CH3-CO-CH3, is a clear colorless liquid with a characteristic fruity and sweetish odor. It is flammable and vapors are heavier than air. Acetone is toxic in high doses. Acetone occurs naturally in plants, trees, forest fires, vehicle exhaust and as a breakdown product of animal fat metabolism. The substance may be normally present in very small quantities in urine and blood; larger amounts may be found in the urine and blood of diabetics. Acetone is used as a solvent in paint and nail polish removers. The phase diagram of acetone is shown below the table. Density and specific weight of acetone at varying pressure and temperature. as well as Thermophysical properties of: Acetylene, Air, Ammonia, Argon, Benzene, Butane, Carbon dioxide, Carbon monoxide, Ethane, Ethanol, Ethylene, Helium, Hydrogen, Hydrogen sulfide, Methane, Methanol, Nitrogen, Oxygen, Pentane, Propane, Toluene, Water and Heavy water, D2O. Acetone is a liquid at standard conditions. However, at low temperature and/or very high pressures it becomes a solid. 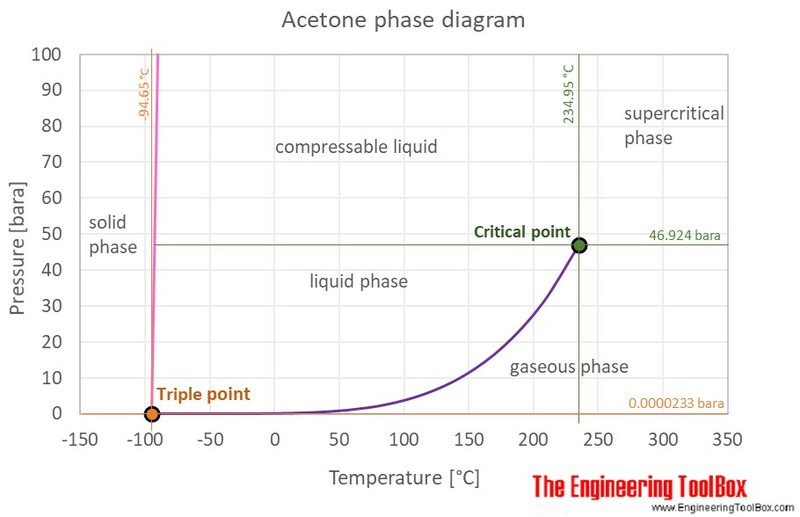 The phase diagram for acetone shows the phase behavior with changes in temperature and pressure. The curve between the critical point and the triple point shows the acetone boiling point with changes in pressure. It also shows the saturation pressure with changes in temperature. Engineering ToolBox, (2018). Acetone - Thermophysical Properties. [online] Available at: https://www.engineeringtoolbox.com/acetone-2-propanone-dimethyl-ketone-properties-d_2036.html [Accessed Day Mo. Year].